AgilePV’s workflow-driven, global AE Staging software facilitates the standardization, automation, and management of your adverse events staging process. That allows you to prepare ICSRs for intake and medical review, facilitating case management, and supporting E2B transfer of Individual Case Safety Reports (ICSRs) to your safety database. With AgilePV’s Adverse Events tracking solution, you'll reduce the time and effort involved in processing Adverse Events from start to finish, while maintaining a secure audit trail that can be published with the click of a button. Now you can coordinate your entire organization's AE staging workflow, even supporting call center case-processing. Segregate your vendor and marketing partner data, qualify that data separately, and then conveniently upload it to your safety database when ready. Replace your manually intensive, often paper-based, and error-prone data entry processes with an automated web-based and mobile AE staging solution. Capture case information from any device and attach relevant documentation. Ensure data integrity through field checks and strict access rights. Generate E2B (R2, R3) verified transmissions to FDA, ICH, EMA, Argus, ArisG, and more. Seamlessly integrate with your home-grown and COTS safety systems. 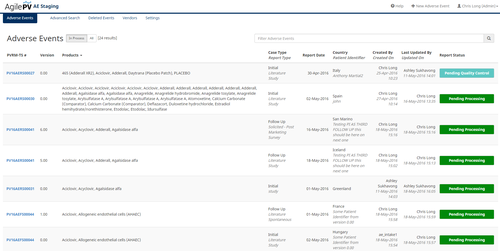 Initiate reports from any device to quickly respond to regulator requests. Standardize ICSR staging, triage and transfer to the safety database. Validated in the cloud. Your intake group is processing emails, faxes, social media, and paper documents with Adverse Events, Product Quality Complaints (PQCs), Frequently Asked Questions (FAQs), Medical Inquiries, and more. When leveraging AE Inbox, your organization will have upfront control over case intake. Your organization has pre-defined response templates based on the type of inquiry, bringing standardization to your communication. 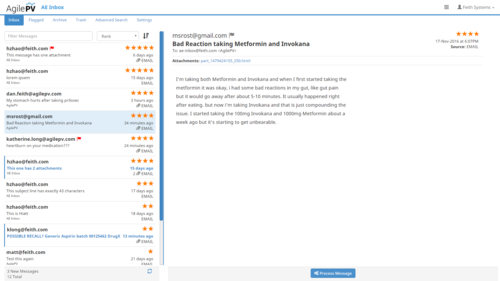 Using Natural Language Processing, automatically identify the case type (AE, PQC, FAQ, MI) and score the likelihood that communications coming into your intake email address, fax number, and other unstructured data sources, are complete. Scoring communications makes it easier to know what is awaiting processing. Rapidly capturing information from any tablet or mobile device will increase the likelihood of you receiving AEs both quickly and accurately. 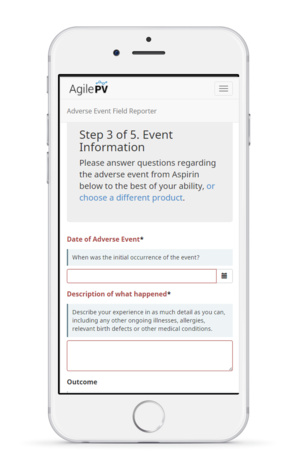 Now you can define adverse event process rules, and generate customized interactive surveys for case-specific details. All your processors need is basic internet access. Tailor AE intake questionnaires to your specific products to make sure processors ask the right questions every time. The case processor will then be able to administer custom surveys or other routine health questions during intake.